Edinburgh Accies - triumphant at the Gala Sevens (picture by Alwyn Johnston). Accies surprised even the home crowd when they defeated Watsonians 21-10 in the final and made a quick dent in the hopes of the Borders sides. Even Melrose fell by the wayside, going down to a Boroughmuir side inspired by a former Greenyards favourite, Tom Wilson, and fellow-Border Chris Laidlaw, while the hosts, Hawick, Kelso and Selkirk were swept aside as Accies joined Melrose at the top of the Ned Haig Kings of the Sevens title race. Gala were struck with bad luck after Currie withdrew and then Heriot’s, Jed-Forest and Musselburgh dropped out because of league commitments – plus the cold, damp weather was not conducive to drawing a big crowd. 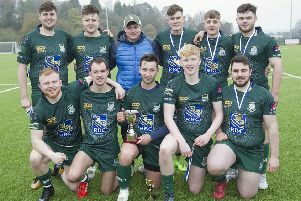 The city sides are making a big inroad into the sevens, and, while Watsonians were crowned Kings in the spring, there was a huge indication that more will be joining them in the future. Accies were inspired by former Melrose player, Richard Mill, in his third season at Accies, who masterminded the team throughout the afternoon and in the final scored a try and kicked three conversions. The failure of Gala (who did not win a tie), Hawick, Kelso and Selkirk to make any real impact was not lost on the crowd, who took shelter in the stand or bars. Accies, who were runners-up in 2010 and 2017, picked up the trophy for their first success after final defeats by Watsonians two years ago and Melrose in 2010. The success means Accies moved into joint first place with Melrose, who crashed out of the tournament when they lost their pool match to Boroughmuir, on 13 points in the Ned Haig Kings of the Sevens table, one point ahead of Watsonians. Gala went down to Edinburgh Accies and Edinburgh University and Hawick were hammered by Watsonians after a win over a President’s 7. Selkirk beat a Select side before losing to St Andrews University, the surprise package on the afternoon, while Melrose defeated Kelso before Boroughmuir knocked out the Kings holders from the Greenyards. The cup-winners led 14-10 at the break, with tries from Ruari Campbell and Max Love, both converted by Mill, to tries from Lewis Berg and Scott McKean. Pool 1 – Watsonians 69, President’s V11 0; Hawick 57, President’s V11 0; Hawick 10, Watsonians 31. Pool 2 – Borders Select 5, Selkirk 45; Selkirk 12, St Andrews University 19; St Andrews University 29, Borders Select 0. Pool 3 – Melrose 43, Kelso 0; Kelso 0, Boroughmuir 52; Boroughmuir 19, Melrose 12. Pool 4 – Edinburgh Accies 42, Gala 7; Edinburgh Accies 28, Edinburgh University 0; Gala 19, Edinburgh University 24. Semi-finals – Watsonians 24, St Andrews University 0; Boroughmuir 12, Edinburgh Accies 19. Final – Watsonians 10, Edinburgh Accies 21.